Alyson Leigh Rosenfeld is a voice actress best known for her roles as Bonnie and Nurse Joy in Pokémon, and Rio Kastle in Yu-Gi-Oh! Zexal. Alyson Leigh Rosenfeld was born in New York City and raised in the surrounding suburbs. She began studying performance early, training her voice classically with soprano Jennifer Aylmer, and acting at Carnegie Mellon's Pre-College Musical Theatre Program. 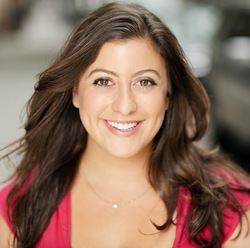 Alyson earned her BFA from NYU's Tisch School of the Arts, where she trained at Playwrights Horizons Theater School, The Experimental Theatre Wing, and Stonestreet Studios. She also studied Shakespeare in performance at the Royal Academy of Dramatic Art in London. She lives in New York City, where she works in theatre, film, television, voice over and commercial acting. She can currently be heard as the voice of Bonnie and Nurse Joy on Pokemon the animated series on Cartoon Network, as well as Rio Kastle on Yu-Gi-Oh! Zexal on The CW, Evans on the Netflix series World of Winx, and Joy LeFrog on the Nickelodeon series Regal Academy.